We have two fantastic interviews for you in Episode 70. 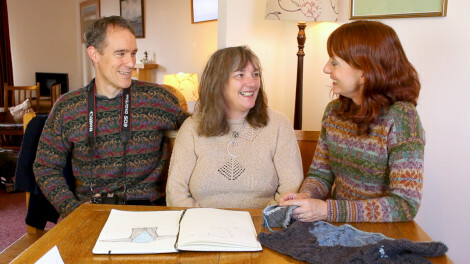 When we were in Shetland we visited the Jamieson’s of Shetland woolen mill again but this time we got to interview Elaine and her son Garry Jamieson. Jamieson’s of Shetland is a 5th generation family business, so it’s great to hear their story, especially told with their lovely Shetland accents! The Spindrift is probably their best known yarn. It’s sold in yarn stores all around the world and it’s a fantastic yarn for Fair Isle and other stranded knitting. Many of you are very familiar with this yarn company, so we are super excited for you to get to know the family behind the company in a more personal way through the interview. We also interview the U.K. designer Di Gilpin, who we did a major featured on back in Episode 55. 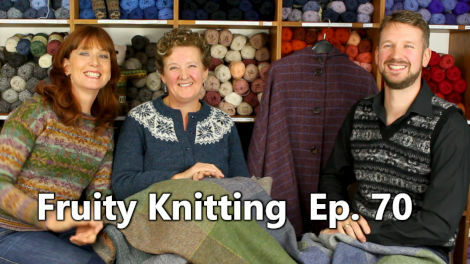 This time Di joins us to talk in depth about the Scottish Gansey which she is very passionate about. Di also shows us a special new design that’s she’s working on and this design is especially for Andrew. Yes, you read that correctly, it’s very exciting! 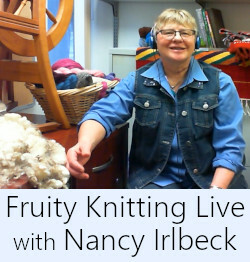 Natasja Hornby from Moonstruck Knits is also featuring in New Releases, we have updates on our projects and Andrea is starting a new craft! Jamieson’s of Shetland is a 5th generation family business that started in the 1890s. The ups and downs of the family business mirror the story of the wool industry and knitting in Shetland over the last 100 years. 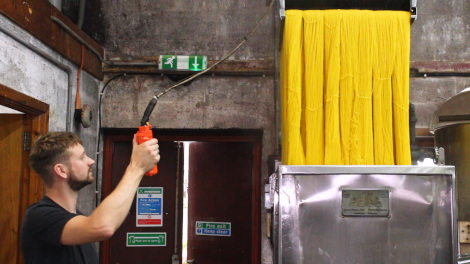 Gary Jamieson is the 5th generation and together with his mother Elaine, they tell us how the business has evolved over this time and how it has managed to diversity and survive. We also get a tour of the factory and follow the raw fleeces journey until it becomes a beautifully wound and labelled ball of Spindrift. 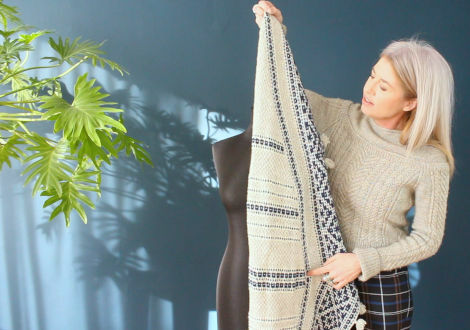 The Jamiesons of Shetland colour palette is a designers dream with over 220 colours and Elaine gives us her advice on how to work with the colours to create beautiful Fair Isle patterns. 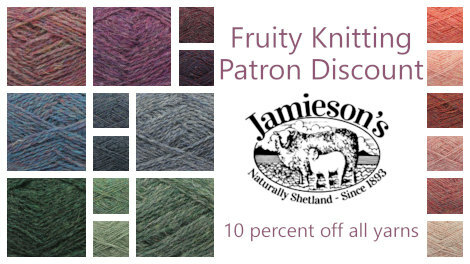 Jamieson’s of Shetland are offering Fruity Knitting Patrons a 10% discount off everything in their online store. This includes their famous Spindrift jumper weight, their DK, Aran and Lace weight yarns in the full range of colours and also knitting needles and accessories and even knitting belts. 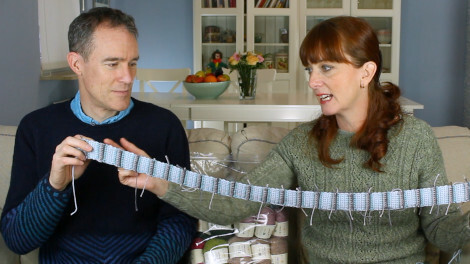 If you have been toying with the idea of trying out a knitting belt, this could be your opportunity. Di Gilpin is a U.K. knitwear designer who creates hand knitted couture collections for the catwalk but she also has a very deep knowledge of traditional knitting techniques. 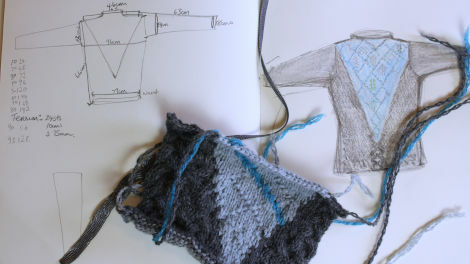 Di lead a research project collecting ganseys and gansey stitch patterns along the Scottish coast line. 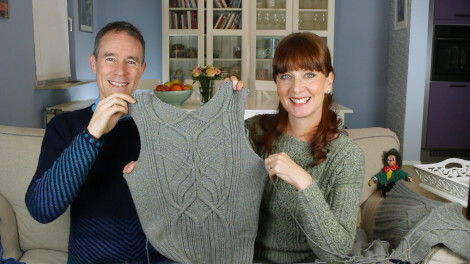 In this interview she gives us a brief history of the Gansey sweater, describes the construction techniques used and talks about the wonderful knit and purl stitch patterns and what they symbolized. 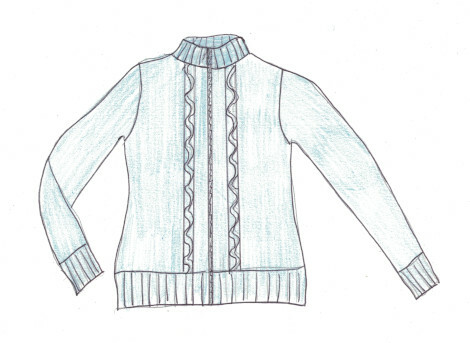 We then go from these famous historical garments back to the present day and take a look at a very modern sweater design that Di is designing for Andrew. Using her beautiful 100% Scottish Lambswool Lalland yarn, Di incorporates lots of interesting Gansey elements into a very flattering jumper for the modern male. Lucky Andrew! 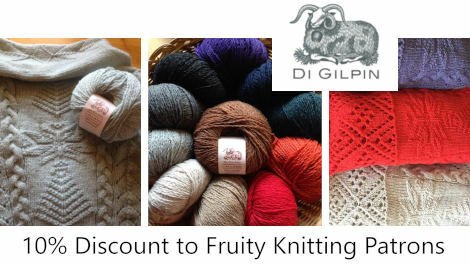 Di is offering Fruity Knitting Patrons a 10% discount off all yarns, kits and patterns in her online store which is fantastic. Di’s Lalland yarn is made from Scottish lambswool and she also has a specialist Scottish wool and Cashmere yarn called Soarse. 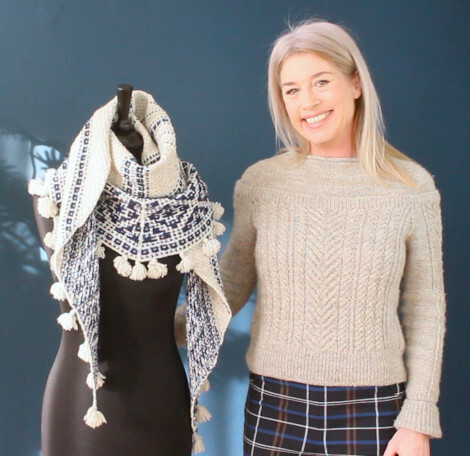 This latest shawl design from Natasja Hornby is a combination of slipped stitches and the Star pattern from Barbara Walker’s stitch dictionary. The result is an extremely elegant design that looks as if the shawl is woven. The construction is just as interesting and the tassels make it super cool. Check out the Ravelry project page to see some really beautiful colour combinations that knitters have already experimented with. The jumper Natasja is wearing is also a relatively new design and shows how skilled Natasja is at coming up with new and innovative designs. Such a stylish woman! 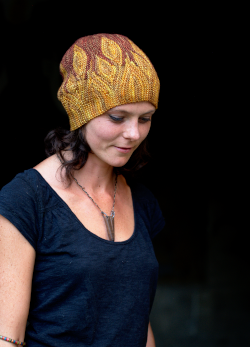 Fruity Knitting Patrons receive a 20% discount off all Natasja’s self-published patterns in her ravelry store. 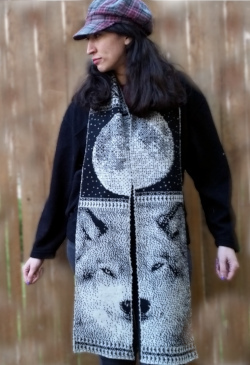 Her designs are gorgeous so enjoy looking through her store. I have finally committed myself to learn to crochet properly. I am a complete beginner, but I’ve taken on a very daring project. 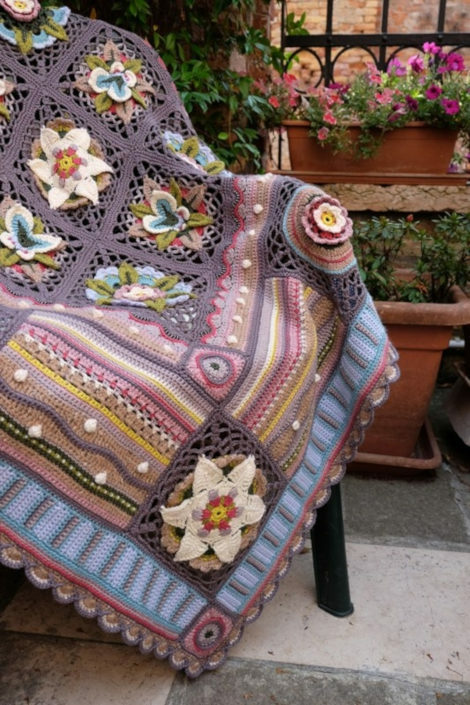 I am going to tackle this beautiful heirloom crochet blanket called Bohemian Blooms by Jane Crowfoot. It comes in a kit including a mixture of Rowan DK weight yarns, beads and a very beautiful book. There are 41 crochet pieces that make up the blanket. There are 8-9 different designs and in most cases you make between 4-6 identical repeats for each of these designs and at the end you join them all together. The good thing is, the patterns are presented in order of skill level and the techniques used get progressively more complicated. You start with a simple stripe sequence which will become a border panel and by the end you are doing very fancy motives using beading and lots of textural and decorative stitches. Wish me luck! 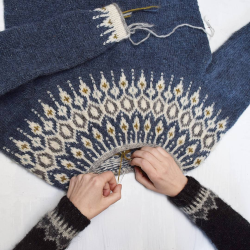 I’ve now finished the front and back pieces of my Nightingale by Norah Gaughan and have successfully got rid of the puckering underneath the steep crossing cables. You have to watch the episode to find out how I did it! Andrew is slowly making progress! Scully’s Reel. Mrs McLeod’s. Cooley’s Reel. The Crosses of Annagh. The Humors of Tulla. The Cup of Tea. Such an interesting interview with Elaine and Gary Jamieson. I loved the cardigan Elaine was wearing, I wonder whether you happen to know where the pattern is published, I particularly liked it as there weren’t too many colours used in the design. This was another excellent episode. The interview with the Jamieson family was absolutely informative and inspirational. I have bins of their yarn and yet feel as though I’m needing to add to my supply. I also appreciate the interview with Nastasja Hornby. I’ve admired her work before. Thanks for aniticipating those of interest to us knitters. Good luck wtih the crocheting, Andrea. 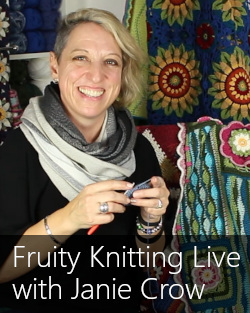 Hi Andrea, It’s exciting that you are branching out into crochet and you’re choice of Bohemian Blooms is a particularly stunning and ambitious piece to start. As someone who enjoys travel and walking you might be interested in “Adventure Walks Books” by Clare Lewis and Becky Jones. I came across an article in Selvedge Magazine, issue 54 that features The Bloomsbury Group at Charleston featuring Vanessa Bell’s country home and garden and a walk that includes the surrounding countryside and town that inspired her. 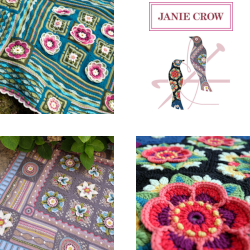 The Jane Crowfoot design captures it all beautifully! I’d be happy to send along the article if you’d like. Thanks again for a great episode. Hi Alison. It’s Samphrey, and you can hear Andrea talking about the collection with the designer Marie Wallin in Episode 42. You can hear more about it in Episode 49 (Shoulder Shaping using Short Rows) and see the finished project in Episode 51!